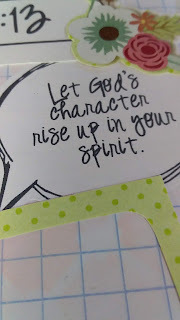 I recently launched a Scripture Writing Challenge for April over in the Facebook community group. Even though it is already the middle of the month, it is not too late to join in. 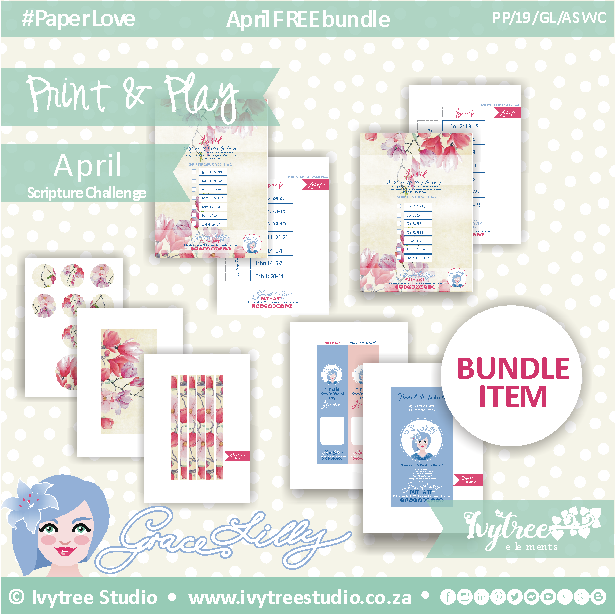 I just loaded the updated challenge pack in the store here as a FREE resource for you to download. 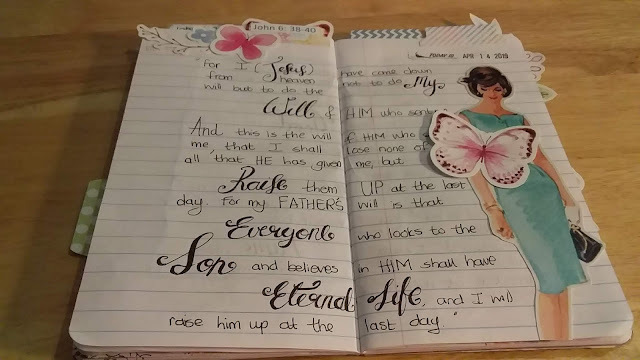 There are about 14 different scriptures to write out. 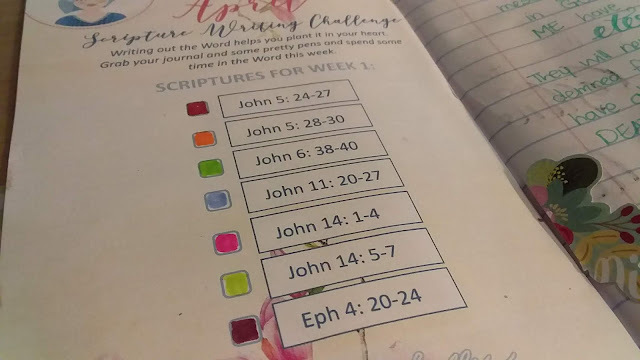 I didn't feel like giving more as I myself have only been able to complete the first set of scriptures this past weekend. So, it is not necessary that you do one scripture per day. If you wind a little time, you can play catch-up or work ahead. Try at least to finish by the end of April. Let that be your goal. 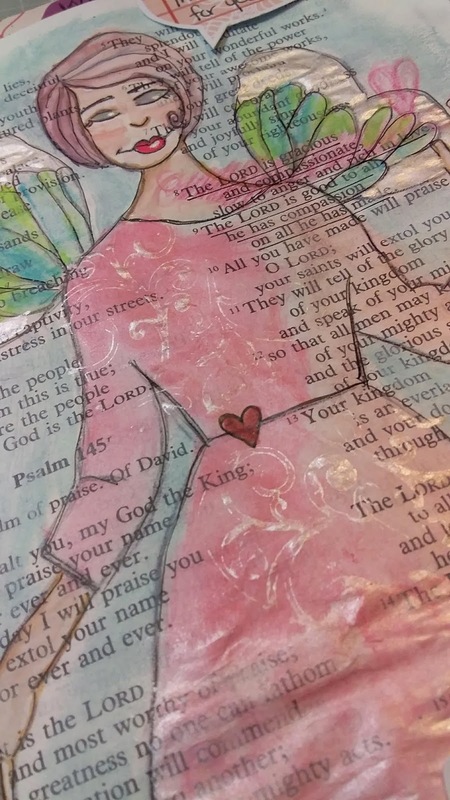 I also want to show you that Scripture writing is important to plant the Word in your heart. Writing it out is part of the learning process. 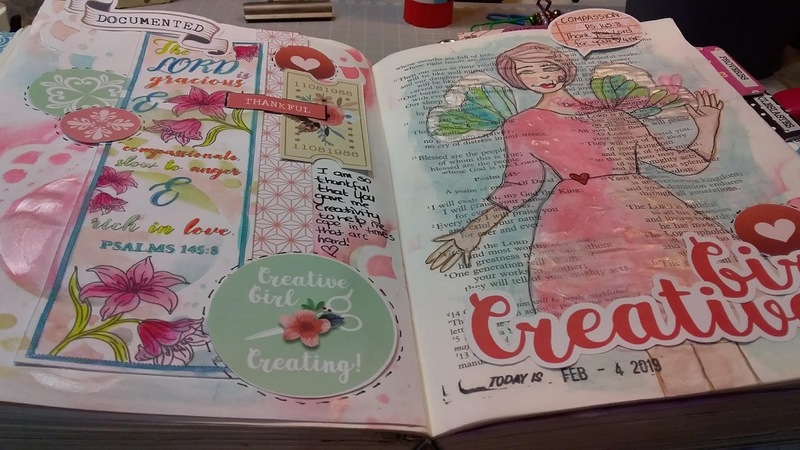 Creative journaling can be part of your process as I show you in these photos of my notebook. 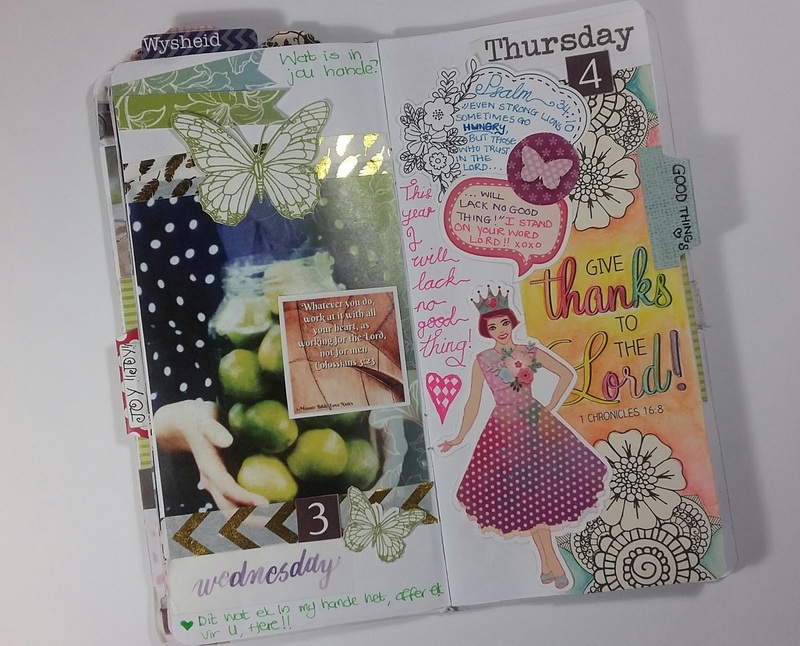 I love the Travel size notebooks as I can keep them handy and take them wherever I go. 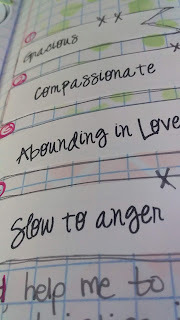 Ticking off the Scriptures from the list also helps you feel accomplished so I added the list to my notebook. You can apply all your Bible journaling techniques to the Scripture writing process in your notebooks instead of journaling in your Bible. 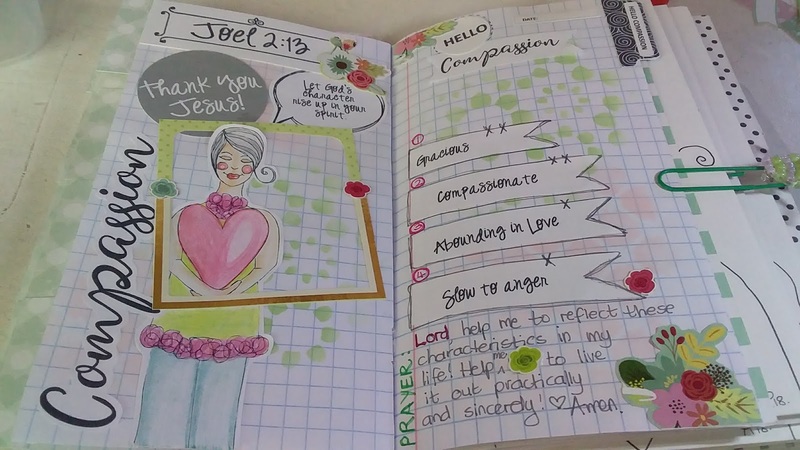 It gives you an alternative if you are not comfortable to journal in your Journal Bible. Watch our Youtube channel here. Is compassion still alive today? This scripture is about compassion. A recurring theme for me lately. So let's look at the word "Compassion" first and what it means. God normally talks to us through recurring themes and topics over time popping up in our daily quiet times with Him, Scripture, and events that happen in our lives. He can use our circumstances to talk to us and enforce lessons He wants us to learn, repeat or take a test on. God is concerned about our character more than our comfort. He will use what happens to us, to speak to our spirits about who He is and what He wants for us to become. Last week we encountered a lady who contacted us online. She is going through some similar challenges to our own but much worse actually. The difference is that we have a family to support us through our trials, but she doesn't. That made me think how very blessed we are. We did what we could within our means to encourage her and to be practical with our support. In the end, I wasn't sure if she was a person we could really trust to tell the whole story and the truth about her situation. I received some discernment regarding this. What I ministered to her was that she doesn't owe us any explanations or need to prove her story. The road for us in this was clear. We didn't encourage her or offer help to gain anything from it or from her. She didn't need to prove her worth before we showed up for her. We did it because God has shown compassion to us and does so daily. He wants us to show His character in our compassion towards others in the same way...even when it is hard to do or uncomfortable. He doesn't ask us to first change or be different or be perfect before He helps us. He helps us because He loves us. He knows that we will change once we realize what He has done for us. My hope always when helping someone God sends our way, is that somehow they might meet Jesus in the process and that would be the greater help they actually need. In our country we are riddled with conmen and women and the general spirit ruling at the moment is one of corruption and deceit. Dishonor, lies, self-promotion, greed, crime, and corruption has become the legacy of the South African people. It really saddens me as we are also known to be about 80% Christian. It doesn't make any sense. So trusting people, especially strangers, is hard to do. Opening up to people you just met, trusting them, doesn't come easy. What we need is discernment in moments when we are faced with challenging situations and the hurt and destruction we see in other's lives. How does God want me to respond? How does He open up the truth to me? It is important to be aware of the quiet voice of the Holy Spirit within you. I know quickly when people don't tell me the full story or tell a lie. How do I know? I asked God a while ago to give me a physical sign in my body, a response that would help me discern honest from dishonest, sincere from insincere and the truth from a lie. He was faithful and used a painful event to open my eyes to that physical gut feeling. I call it my "pit-of-the-stomach-nauseousness"-feeling. I know God uses it to protect me and make me aware and then He will guide me through my obedience of Him, to do the right thing and show me how to respond. What is important to note is that through His Word and His values He teaches you over time, you will know and have the right response at hand. Always act from a place of peace and calm. That is number one. If you feel rushed or pushed into something, stop and rethink it. Nothing done in haste is from God. You can know it is probably not. God is a God of order, so allow Him time to speak to you when you need to make desitions. When someone asks for help, no matter how desperate their situation, also ask God for His leading in what to do. Always be kind and compassionate. Jesus didn't send people away. He met their physical need as well as their spiritual need all at the same time. Follow His example. But when you discover that someone is not being honorable in their dealings with you or has a hidden agenda, tread carefully and ask God for wisdom. My husband has a great gift of giving. I always remind him that never offer something to someone if you don't have it to give. You cannot offer someone else's resources too. Always give what you know you can give because you actually own it yourself. It is available to you to give away if you want to. Don't make empty promises because then you create an expectation in someone's heart that you may never be able to fulfill. Also, don't give hesitantly. Give freely. Don't give because you think the other person deserves it or not. They may not deserve it. It doesn't mean that God doesn't want you to give it. Be obedient to Him first and foremost. If He says give what you have, then do it. He is your reward. Because hubby's first instinct always is to give, he needs me to remind him to stop and think about it and ask God for His will. It is a wonderful gift to have, but people may abuse it. Once again, we all need wisdom even in giving. I saw my husband stop the car and take off his shoes to give to a begging boy who barely had a shirt and a pair of shorts on. We were on our way to the shops and when we came back the same way, he was still standing without shoes, in the middle of the road, begging. See, he probably owns a pair of shoes on the side, but he needs to play the part to get people to give to him. The worse off he looks, the more people will stop to give him money. We just gave him shoes, and yet he wasn't wearing it. So, what was the lesson here? Should we have stopped or not? Was it about what we did or was it about how he would respond? This lesson cost my husband a pair of shoes. I know he now thinks about it and asks God for His leading. I learned this lesson while on a missions trip to India a couple of years ago. The beggars are actually a community all on their own. You are born into that community and you will probably die in it. Parents (and this broke my heart) will break their baby's bones so they are lame and can play the beggar part more convincingly. I saw this with my own eyes. Young boys limping on the ground, begging for money or food. It is heartbreaking. What I took away from this was that some people don't even realize that what causes bigger poverty in their lives is the fact that they are dishonest, that they use their situation to the fullest and con people into giving. They con people who would probably have given to them anyway. They play the "heartbreak" card and all that does is make us think twice when someone really in need comes our way. How sad. It is uncomfortable to be faced with people in real need. It is painful to see and think of, right. Most people quickly give something so they just don't have to deal with that person or situation any further. That is not compassion. That is also not the attitude Jesus wants us to have. He paused His program and busy schedule and even His ministry to get sidetracked by those in need. He gave them His full attention. He loved them. How can we do the same each day? So, should we give or not is the question? If the world is so corrupt, should we still open our hearts and give? We often get people at our gate and my dad use to have a little ministry going to give them food and the gospel. If he could, he would give a bible, strike up a conversation. But lately, things have become so hairy in our country that you cannot afford to open your gate to strangers. One frequent beggar comes with a real nasty attitude and we suspect he stole our copper doorbell at the gate. He is always insistent that we give him what he wants and not what we have to give. I am adamant not to open our place of safety to just anybody. But in the end, I know that Jesus, despite the realities of my life in my own country and the experience we have in this very cruel, very aggressive and unstable loveless world, still wants me to live with compassion. He said that we would always have the poor with us. "Poor" to me, is not just lacking physical things, but also spiritual. I know He came to seek and save the lost. So that should also be my mission and the mission of every believer. I know that we are facing a very difficult time in our country with the elections coming up, the aggression and corruption pot spilling over into social media and the news daily, but I know that God wants believers to shine His light of Righteousness wherever we can whenever we can. 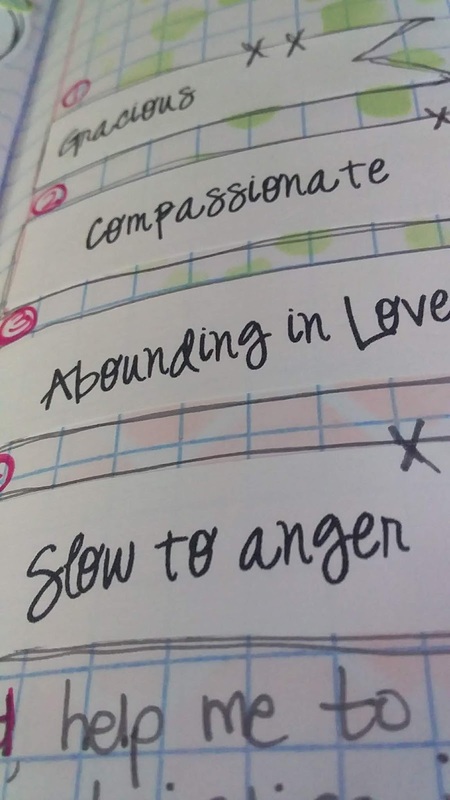 I challenge you to not just journal about compassion but to live it in every situation that comes your way. It is not about people deserving of it. It is about Jesus giving it to us freely, so we can spill it over into others. WHERE TO FIND THE ART FROM THIS BLOG POST? are excited about what is to come. Today I would just like to share a post with you about seeking God's Face. 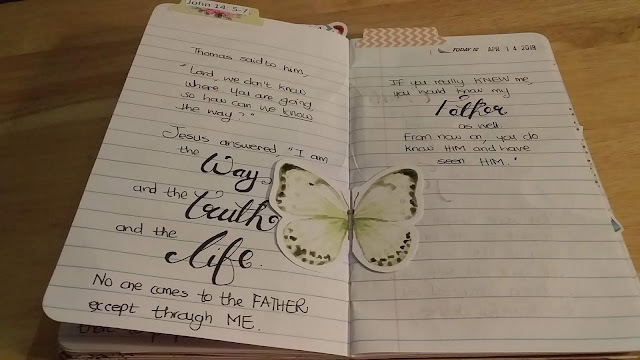 As I am playing catch-up on all my writing and blogs lately and starting new journeys with it, I feel like I am always growing closer to living out God's purpose for my life more and more, when I write. Today's topic is seeking God's Face. Last year when I stepped out with Gracelilly, I knew that it was something I really wanted to do and felt equipped to do. 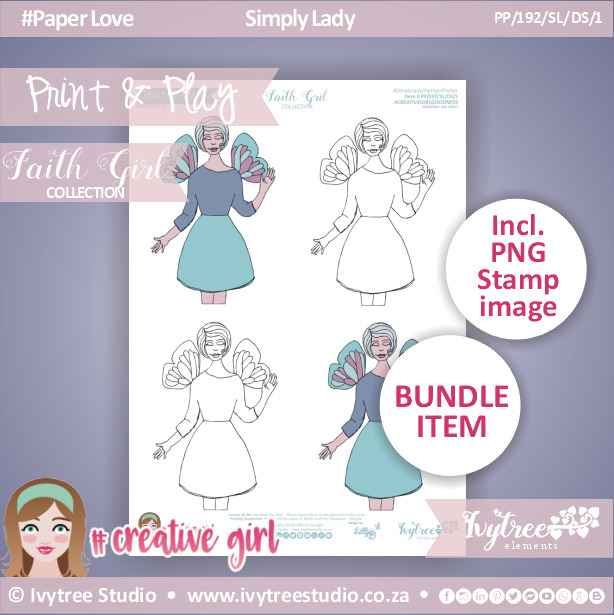 I shared a couple of online Bible studies, created some artwork and digital kits en wrote a couple of devotionals. It gave me such joy to be able to bring my teaching skills, love of art and creativity and my biggest love, God and His Word together in one place. My heart with it, as is also God's heart, is to reach others with the love of Christ. 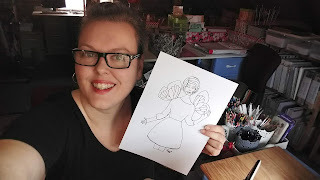 But then a couple of things happened that halted the whole process and I was forced to really look at what I was doing and how I was doing it and where and for whom I was doing it. A couple of things needed to happen first before I could move forward into the "ministry" I so desired. One of the things that happened was that my laptop's hard drive crashed. I was working my little laptop so hard that something happened that never happened to me before. I use to have good housekeeping habits for keeping my tech safe and secure, but I was working so hard that God needed to physically stop me by shutting down my computer to get me to slow down. He protected me and turned everything around and I really didn't lose much else than the use of my computer for a while and the discomfort of the disruption. But I knew God was saying: "Stop, I want to do something here". I took me a while to realize what that was and it took me the year to really see the picture. I am still in need of some adjustments here and there, but I know He is faithful to guide me trough. Before I could move forward, I needed to look back, regroup, rest and really listen. It was a hard year emotionally and spiritually. It took me a whole year to really get back on track with Gracelilly and I feel that all the things that happened were necessary for me to see things from God's perspective. 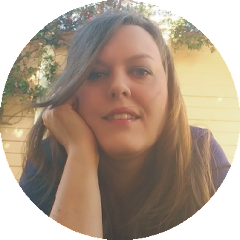 I made big changes to our business and how we run things and I have such peace about it. :) It was a scary thing to trust God when what He was asking me to do looked like He was shutting us down, but He wasn't. So without going into too much detail, the bottom line is that we sometimes need to let go, fast from the things that occupy us so much, even the good things like our art, our work and just get back to basics. A big thing for me now is to sort through all my creative ideas and wait on God. Wait for Him to show me the green light on the ones He wants me to follow through on. I have to work on waiting on God for His timing. I will always have to work on this and I think we all do all the time. Oh, man can I be impatient. 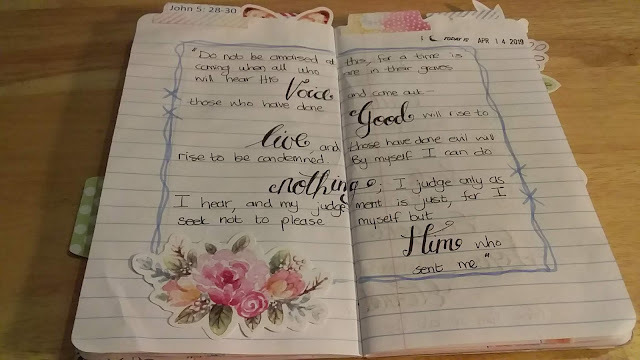 I know that my lesson through this past year was to take note of the things that are more important to God in comparison to what is important to me. He is interested in how my heart is doing. He is interested in how things of the past affect my present responses or actions. He is interested in restoring what the enemy has stolen, revealing the enemy's lies in our lives and in loving us to wholeness. None of us can really say that we are perfectly complete, whole or untouched by this life, can we? So all of us do need His healing hand to guide us to that place of rest and restoration. My word for this year is RESTORE. I need God to restore my broken places, to restore what the enemy has stolen over time through his lies and deceit. For me to have balance in my life in all the things that are important, I need to seek God's Face. How do we do that? Seek His Face? What does that mean practically speaking? I am a visual person. I am also a very tactile person. I learn through actively being involved in the learning process. You call that being a kinesthetic learner. = a learning style in which learning takes place by the students carrying out physical activities, rather than listening to a lecture or watching demonstrations. Most artists and creatives are kinesthetic learners I presume. We would rather touch and feel and smell and physically try things out than to just listen to someone talk about it. 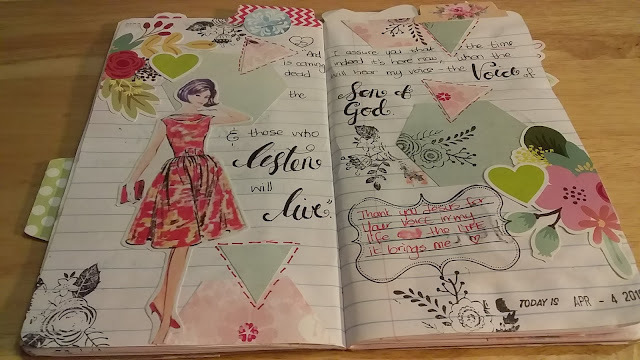 So Bible Journaling has always been something I did naturally. I remember sitting at Christian Students Association Camp in Winkelspruit at age 17 doodling and making notes while the Preacher was teaching us about God's Word. We had daily devotional meetings where over 250 students would sit in a large assembly listening to the sermon. I had my notebook as it was also encouraged to bring your Bible, notebook and a pen to camp and I was writing stuff down and doodling in the margin. Most of my note taking over the years involved writing my prayers down, Scripture writing and sermon notes. That is how I learn. I cannot sit and do nothing in church. My mind wanders and I lose focus. I am a big daydreamer. Al my creative ideas come from daydreaming...it is a powerful thing and it needs to be harnessed. Making notes and writing helps to accomplish that order in the brain. So my point is that seeking God's Face can also be an active thing. Sitting down with your Bible and your notebook and involving God in what you write down. It is a partnership for me. Me and God in my quiet time. Writing this post is a partnership with Him. I am the vessel and He breathes through me onto the pages that I write. When anything of importance comes out, you can know that He takes all the credit for that. When we make choices in how we want to live and what we want to do with our lives, it is important to involve God in those choices. He is the One who made you. He knows why He made you and what His purpose with your life is. When you give your life to God, as I did when I was just 15, something marvelous happens. He really comes to live in you and with you. 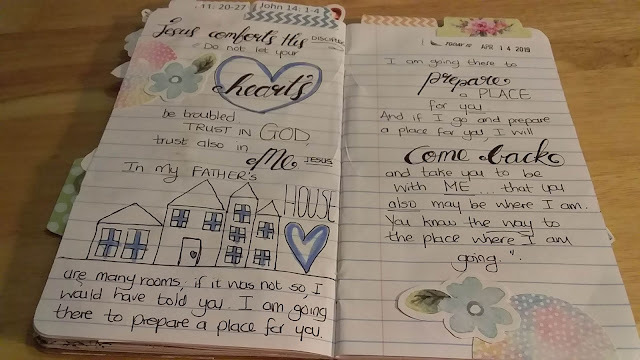 He makes your heart His home. That is such an awesome thought. While we all have challenges in life and hang-ups and things happen to us, it may cause us to lose our focus or to sway from the path He would want us on. I constantly have to check back and make sure that I am still on that path and the wonderful thing is that His Spirit will always lead you back home to Him. My story isn't finished. I know that He is definitely guiding me somewhere awesome even though I cannot see the full picture yet. I know I can trust Him to lead me there. Sometimes, when I feel discontent in my heart and I process what I am feeling by really quieting down, slowing things way down in my life, He is always faithful and works in me to show me what it is that I am feeling or what it is that is causing the discontent. Discontent in itself is not a bad or negative thing. It may just be God's Spirit re-directing you or re-aligning you with what He wants you to do or where He wants you to go in a specific moment in time. Be ready and willing for Him to lead you away from what you are doing or planning to do, for what He may ask of you, that interruption in your schedule may just be way more important than what you had planned. Sometimes feeling that discontent is fear holding me back. Then He will encourage me to stand in faith and trust Him to help me be more courageous. Sometimes I process conflicts of the past and He will show me why I went through uncomfortable experiences and who was to blame or why I need to have grace for myself and the other person. He helps me understand and process things correctly according to His truth and not necessarily my own or other people's. Sometimes He leads me to understanding just by whispering into my spirit a truth about me or about Him or about a past hurt and it is just over and done at that moment because His truth sets people free. It is something very profound that happens so quietly without any real big event or moment but you know that you know He spoke to you. You also know that from that moment onward you will not be the same again. I have had a couple of these moments throughout my life and I treasure them. I remember when working in Saudi Arabia a couple years back, one day I was standing in front of my cupboard and I had to decide which clothes to pack for another weekend in Riyadh, the capital city. We were working in a desert village that looked like the surface of the moon, isolated and very dusty. We were paid very well, but while working there we realized why...it was really a very harsh environment to a large extent and a big culture shock for most expats. It was part of our remuneration package to receive a sponsored night in the city at an expat compound much like a holiday resort but with walls and security and barbed wire. It was our sanity break to go to the city. I will always remember very clearly the Voice I heard audibly in my spirit that specific day: "If you stay here, you will lose your soul". We had a two-year contract, but we only stayed for 6 months due to our company not being able to secure long term visas and the stress of the situation and a lot of other factors showed us that God wanted us from the start to only stay half a year and then come back home. Someday I will share the whole story, but for now, this moment was important. God speaks to us at times very clearly. My main reason for not returning to a country where I really felt I could make a difference in the lives of my beautiful students, was that Voice on that day in front of my open closet. It was a "no" from God. It was a "go home". It wasn't an easy choice to make. It had very big financial and circumstantial repercussions for me and my husband for the long term. It was God saying: "Will you trust Me no matter what?" and boy, has it been a really difficult difficult journey. I have never in my spiritual life experienced such a difficult season as the one God has been asking me to go through the past decade, but this one choice I needed to make would affect my comfort and my future security. God was saying "I am your Source and you need to trust me that I will provide for you and look after you" and He has. Seeking His Face in the moments when you land in hospital with a scary diagnosis, or family abandons you, or the one you love is in turmoil, or you see your elderly parents grow old and frail and sick, or friends desert you, industry reject you, fellow Christians attack, persecute or discredit you, and your fridge is empty, your dreams fade in the distance, your dreams to have babies of your own grow dim as you celebrate yet another childless birthday and years grow into decades, then seeking His Face becomes an absolute necessity. When you experience that harshness of life and years turn into decades and your fig-tree still doesn't bear fruit, then it starts to really matter what you believe and how you live that faith. Being honest and open with God in your darkest times, when you really don't get what it's about and you perhaps question your beliefs, that is when you need to seek Him and seek His Face the most. As a young girl in the Church, I remember how we sang that song about the fig tree and how we would keep on believing and praising God even if it doesn't bear any fruit. 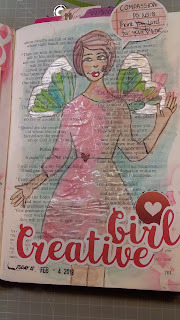 I am in my midlife now and God uses those songs of my youth now to bring it to life and show me why I needed to learn how to sing them then when everything was rosy and all of life seemed filled with color and light and possibility. It is so important to know God and choose Him when we are young so that He can build our faith for the long haul. So it really can grow deep roots to anchor our souls. I am thankful that God took my hand back then and helped grow a steadfast spirit in me. Though my flesh may fail my spirit is strong and I only realized how strong while going through the difficult times in my life. So seeking His face in the difficult times may not look rosy and it may be filled with tears or anguish or doubt and fear even. But I know one thing: I will always always run into Him because not only is my home in His Word but His home is in my heart and it is less about what I do or how I act or feel or respond and more about Him and how He leads me to quiet waters where I can look up and know that I am loved. So when I hold my heart in my hands and close my eyes as an offering to Him, seeking His face in the moments I feel lost or broken or empty, He is faithful to bring me through it all to waters that will quench my thirsty soul and a place where I can rest and know: I am loved by the God who made the Universe and He knows my little name and has inscribed it in the palm of His hands. He pursues me relentlessly out of love and He uses the difficult seasons to bring honor to His Name through the witness of our faith in Him. So, dear Gracefilled Lillies, let your difficult times become your witness of the God who loves you through it, stands by you when the world fails you, provides for you and heals your broken pieces. Let the mosaic of all of that be your banner of truth and fly it high because His banner over you is LOVE. God's power in us little frail humans can turn a coward like Gideon into a mighty worrier. It can turn a shepherd boy like David into a King. A stuttering murderer like Moses into leading a nation. His economy works differently than this world's. He can heal the blind with a little spit and dirt, raise the dead and bring little children back to life. He can give countless barren woman more children than the married and turn ashes into beauty. So my story isn't finished yet. As I continue to seek His face regarding my purpose here in this venture and countless others, I realize that it doesn't really matter what we do. It matters why we do it and for Whom. 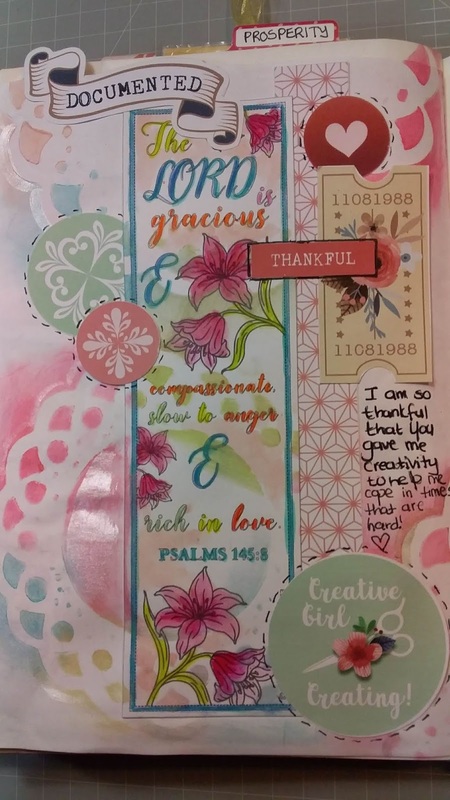 So when you sit down and work on your Bible journaling, forget about the product and the techniques and focus on God, the Word He is giving you at that moment and then study it as deep as you can for as long as you can and make it your own through your creative expression. Date it so you know when He spoke to you and what He said. Return to it often. Another one of my God moments was when I was in the hospital a couple years ago, feeling scared. I asked someone to pray for me and she didn't know what Scripture I was reading but confirmed actually through her words of encouragement to me, what God had already said to me at that moment. The main lesson was that God sees into our hearts and He knows if and when we are being sincere when we have a request or some kind of need. That sincerity is key. God saw my heart at that moment and He answered me. He knew instantly that the women who touched His robe in the crowd desperately needed His healing and He gave it to her. I can relate to her not just because I basically have a similar challenge, but because I know who to go to, to find my healing. Jesus is the gentle Healer and as the Michael Card song rings true: "He came to my town today". God can see were people cannot. He knows our true self better than we sometimes do. Allow Him to come to your "town" and bring healing there as you seek His Face. I didn't know what this post would be about, but I am glad now that I was obedient and sat down to write to you here today. It reminded me of a couple of things and I hope that it has encouraged your heart too. When you work on your journaling, remember what is important. Remember who you are doing all of that for and why. 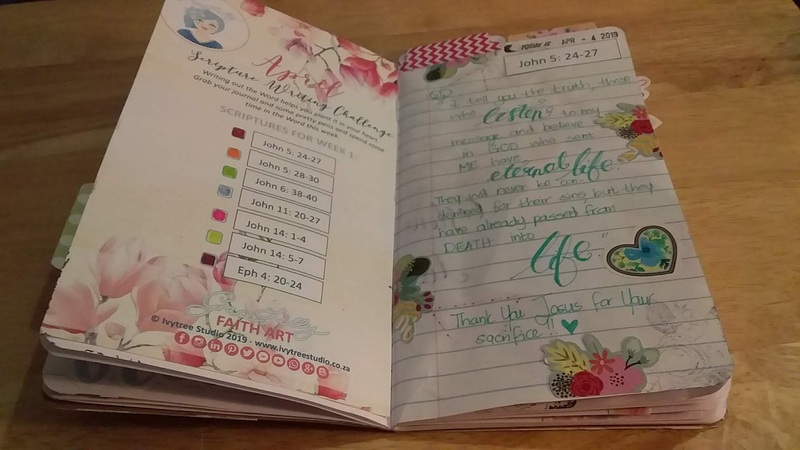 Journaling about God, or His Word, using a ton of product or kits or paper or whatever is all empty and void if there is no connection between you and Him. Prioritize that first and all the rest will be a happy expression of that meeting. 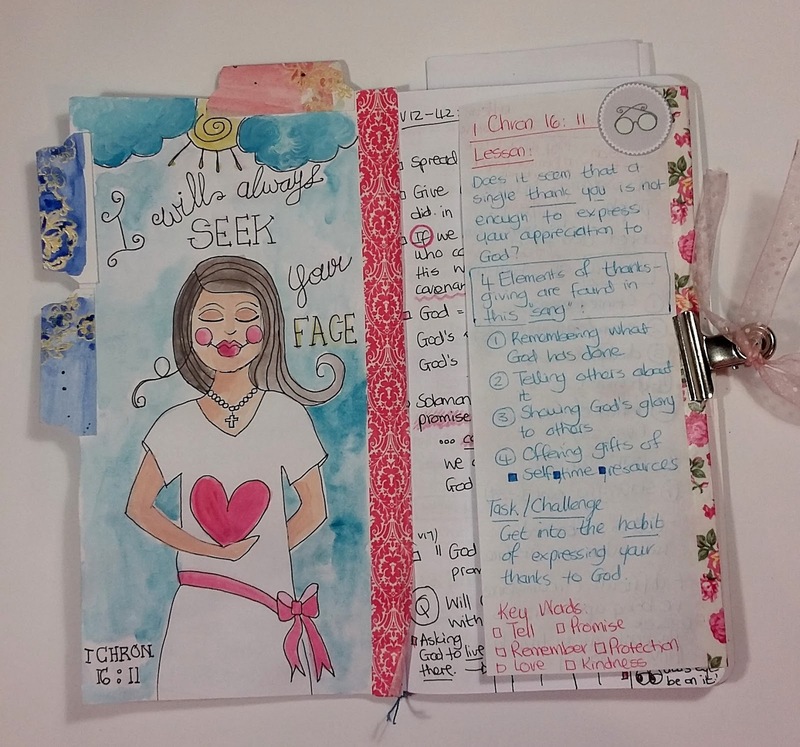 Journaling outside your Bible - Can it be done? Question of the day: How do you journal God's Word and pray at the same time without doing it in your Bible? Yes, it is actually possible. I would like to offer you some options. 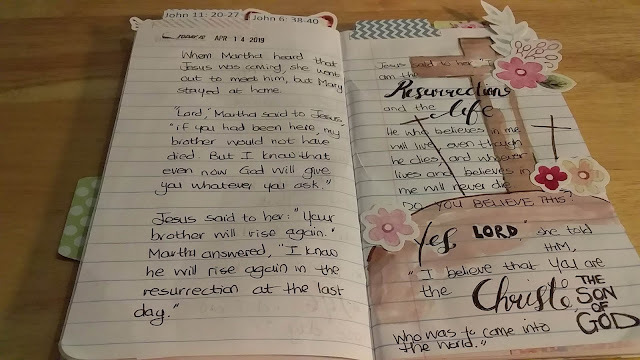 For many many years, most Christians would carry notebooks or journals with them to Church and have a pen handy. They would take sermon notes. 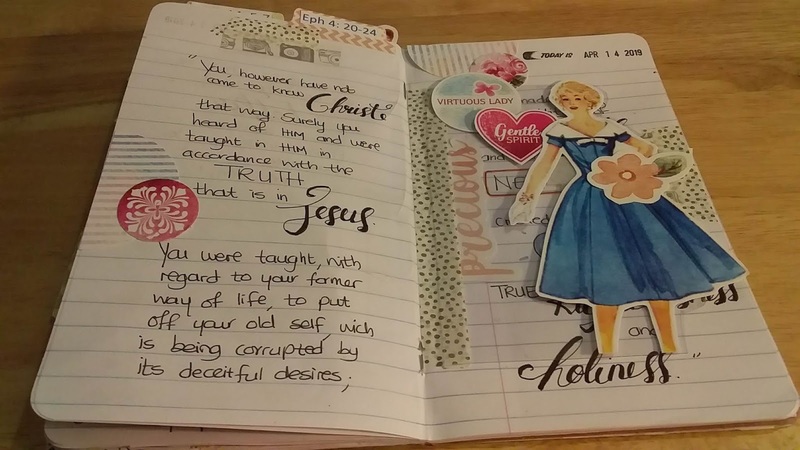 I did that too, but I also Micro Journaled in my Bible, making notes in the sideline, drawing little hearts, doodles and more to help me remember what I learned and also dating the Scriptures and underlining it. All of these habits are good learning habits. Take it from me, I'm a trained teacher and studied the Word from an early age. You don't need an expensive fancy journal Bible to be creatively journaling your faith and journaling about God's Word. A notebook is still a very acceptable place to do all of that in. Don't get swayed by popular media and industry. God's Word is all you need and your journal. Make your own books. Start in a normal exercise school book. They are very cheap and affordable and just as good for the process and even better actually. 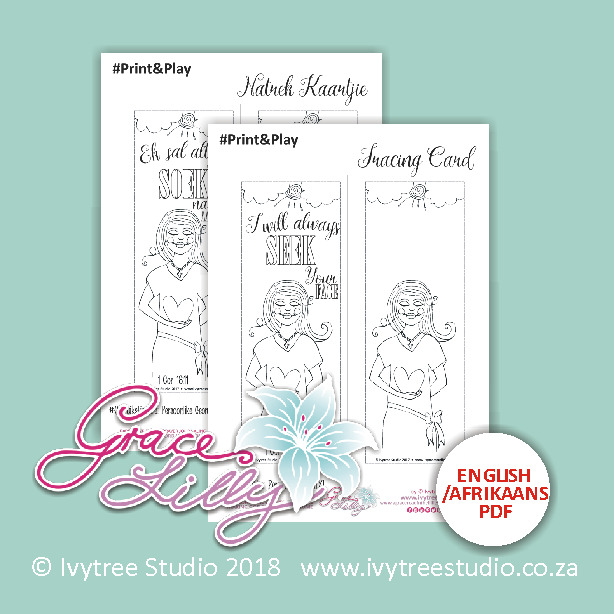 You can choose between A4, A5 and TN size (just trim the A5 down to a TN) and cover it with paper or paint a cover on it. Add your beautiful paperclips in it. Very soon you will have filled your books and not your Bible. You will be able to actually use your Bible, one Bible for a very very long time. 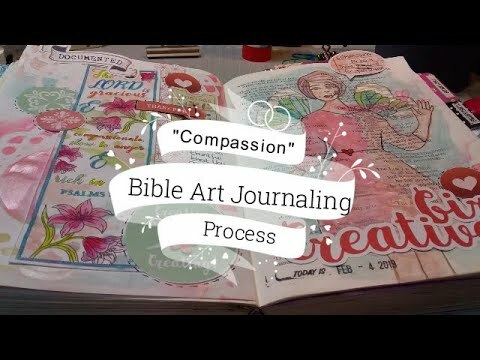 I don't own a journal Bible and I don't think I will buy one probably. I just can't see myself spending that much on something that I will also probably never "color in" with products just because it was so expensive. I salvaged an old NIV that was falling apart and I use it for creative expression but also just for reading at times. It is in my studio while my study Bible is where I normally have my quiet times. 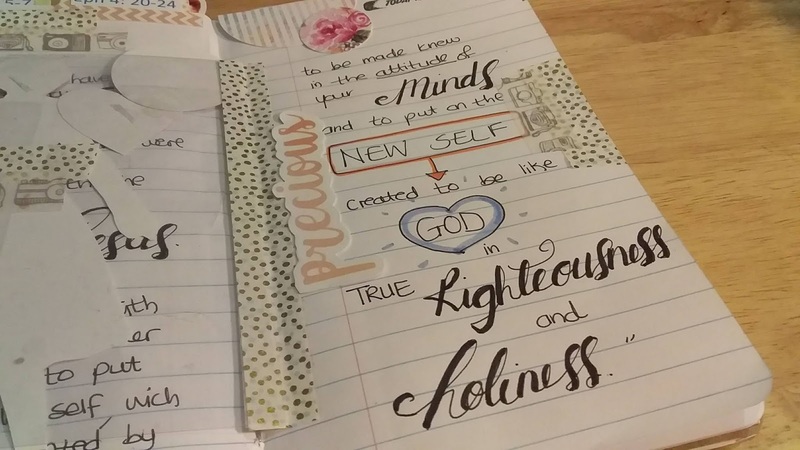 It is a personal preference, but to me, it makes no real sense to fill a Bible with ton's of art products and try out techniques in it. 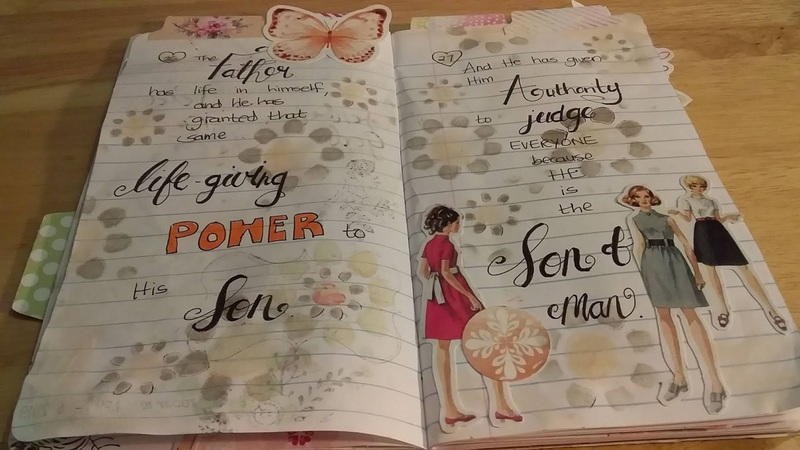 That is what an art journal is for. I also can't see the point of just highlighting one verse and covering the rest with paint and products that make it difficult to read. Remember that reading the same section in the Word again and again over time, will always give you new insights. You can't cover it and just focus on one part. You will miss out on the richness and depth of the Word. Also, remember that the Word is alive! Allow God to speak to you through all the parts, not just the parts you like. That is a challenge to all of us to keep in mind. So, I'm writing you this post today to just make you think about where it is you are going with your "Creative Worship". Include God in it and ask Him to lead you in the direction He wants for you to take in His Word. I can witness that God had me ask many questions and think long and hard about what and how I was engaging with His Word. I will always have to answer to Him. So be careful with God's Word and be careful about who you allow to "teach" you, what they teach you and how they go about doing so. Never ever focus on the product or techniques but rather on how they are used to honor God and His Word and bring about His purposes in your life and the lives of others. 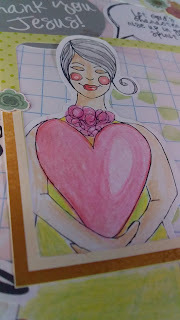 If you really want to art journal, then get an art journal and do just that. You can use all the products to your heart's content. But if you study the Word, really study it. Don't just add stuff to it, for the sake of adding stuff. And also think about what it is that you are adding. Did you know that there is a scripture about not adding anything to God's Word or taking anything away from it and it comes with a stern warning? Click here to read the Scripture and ask God to speak to your heart. I'm doing the same. I want to make sure I am on the right track with what I'm doing. So let's honor God and His Word today with how we go about using it. This post is not about judging anyone or about criticizing any particular way or process. It is to place the focus firmly on God first, on honoring His Word the way He intended for us to use it and engage with it. If we as believers allow an industry to dictate how we study the Word and how we learn from it and engage with it, we might find ourselves on the wrong track very quickly. Be mindful of the fact that industry is profit focused and God is not. I also needed to ask myself serious questions. I am a believer first and therefor ministry focused; a teacher second so I'm people focused and I own a creative business to put food on my table, but God is my Source. 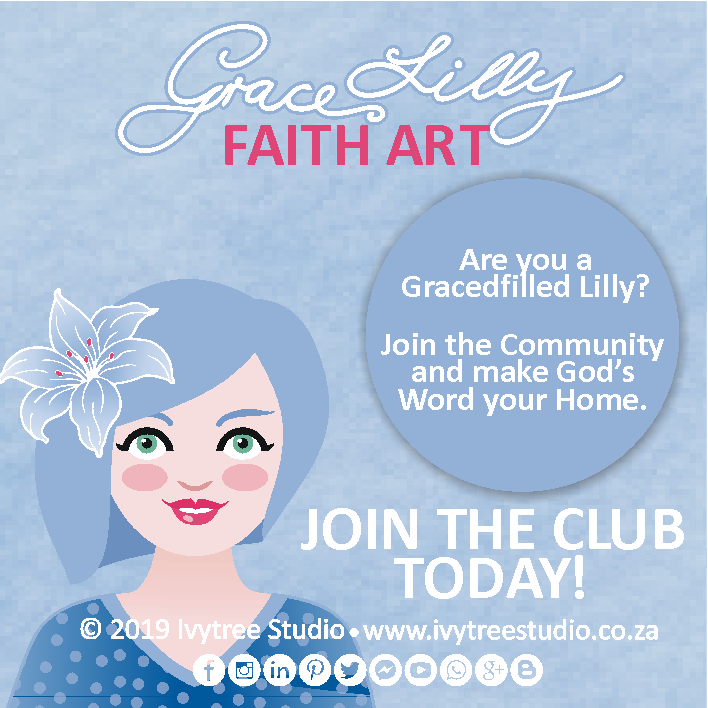 I had to check my focus and my purpose with the Gracelilly Faith Art initiative and that is why I have probably not been so active with it as I would have liked. If I look back now, I feel God's Spirit want me to take note of some things happening around me in the "industry". Remember that God is not interested in the industry but rather in our characters. 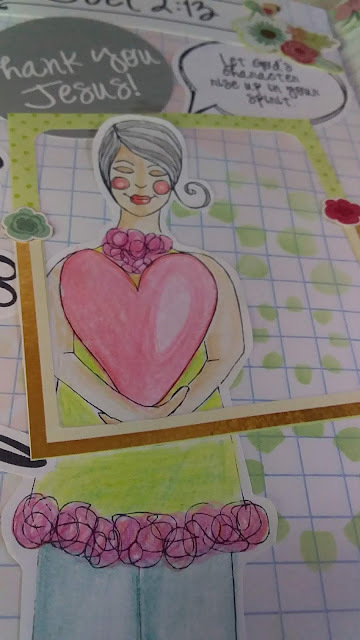 I still want to do more Dreambook workshops because I know what the process of keeping a visual prayer journal meant to my spiritual journey. But I don't have any desire to do the "Illustrated Faith" thing. 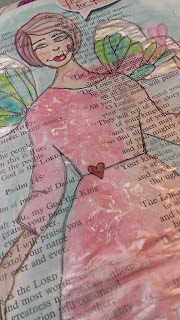 I want to journal creatively and because I am a believer it will include my faith, God's Word and teaching and my art. I communicate that way naturally. Always have. 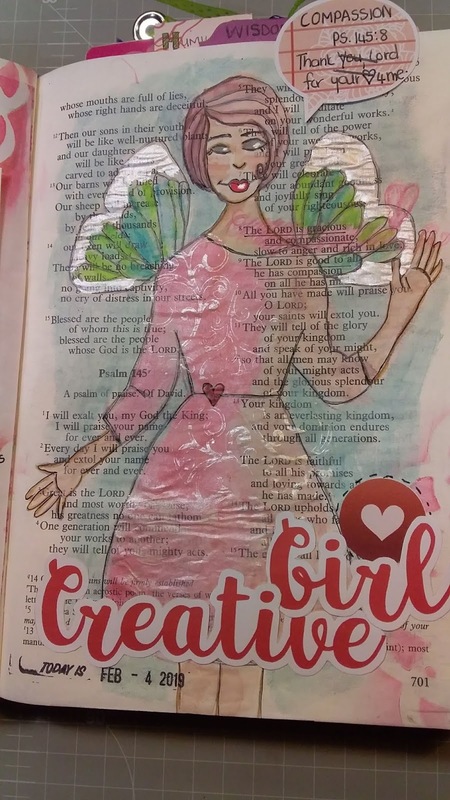 No matter if I make a card or paint a painting, God's light and love will shine through my spirit onto the canvas or journal page in a creative way. The distinction God gave me recently was through the scripture about the seeds and the various places it falls. I'll do another post about this scripture another time. For now, I just want to mention that God made it clear to me that the seeds I sow are not the problem. 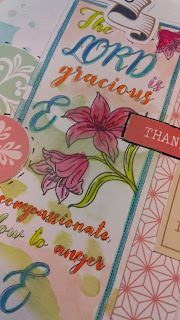 He gives me my talents, thumbprint, unique and artistic way of communicating, the things I create using the gifts He has given, so He is the origin anyway and that's all good. It is actually about "WHERE" I sow those seeds and how. The ground I sow it in. So, make sure you sow in the right places if you want to make sure there will be a harvest. I hope you consider the journaling options above. They are much more affordable and sustainable. Sometimes you stumble across an old bookmark or a card with a scripture on it and God uses it to stir something new in your heart. 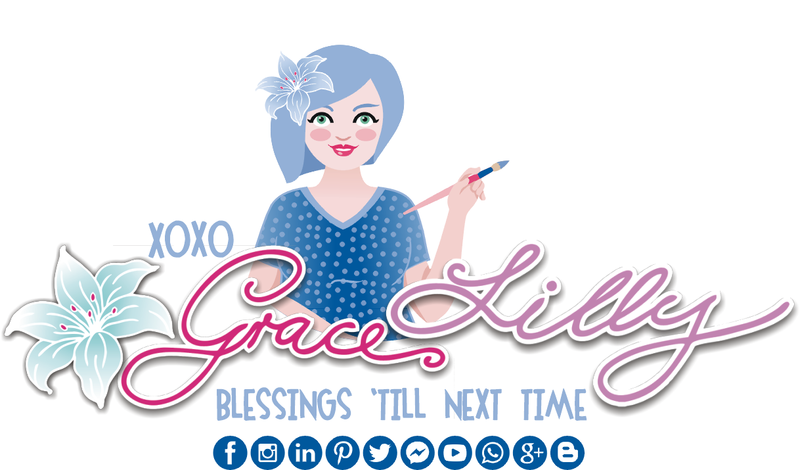 I created a free bookmark when I first opened my Gracelilly group on Facebook over a year ago. I printed it for myself and popped it in my Bible. This year in February, I came across it again. The scripture on it was Psalm 145:8. 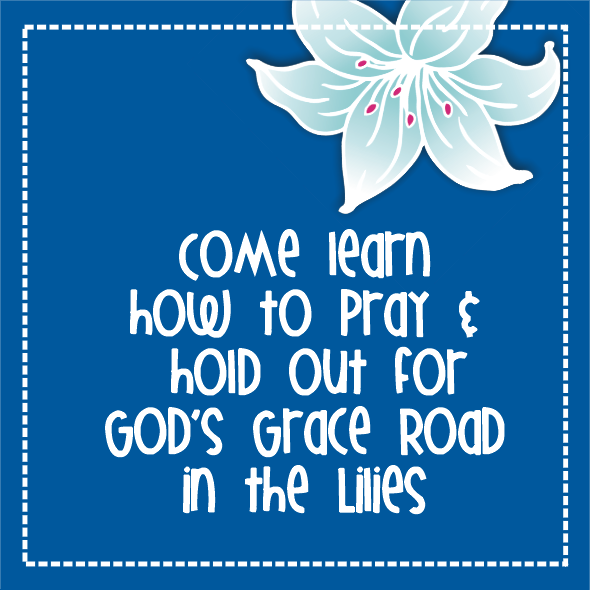 It is all about God's grace for us and expresses His character in stark contrast to our own. A scripture about Compassion. My dad who is also my spiritual father, pointed out lately that He is so glad that God is not an old man with a wip standing behind you with a stern face waiting for you to mess up so He can punish you. Today I watched a little video Jospeh Prince shared on the Holy Communion and also a clip on His latest sermon series releasing soon and it is about winning the fight against the enemy. He starts out to say that the enemy's greatest achievement is to get the world to believe he doesn't exist. He is a sly "devil"...pun fully intended. He works on our minds so we believe he is not out there (while he actually is and targeting believers intensely). He wants us to doubt God too. If we doubt God and we doubt ourselves, we are limp and powerless. It is all however a smokescreen. We need to understand and know the Word and we need to speak it and pray it over our lives and protect our hearts and minds with it. My fight against the enemy is real and I sometimes feel like I am losing the fight, but I know that God has won the battle for me. I may not be perfect and fail all the time, but as Joseph Prince pointed out in his latest video about he Holy Communion, the Israelites where just as terrified and scared while they were living through the first Passover. Joseph Prince explained so eloquently. What stuck with me was the visual that they might have wailed in agony and fear (just as the Egyptians probably did), but what protected them was the blood of the "Lamb" on the door posts. Today we may sometimes "wail" and fall apart over the challenges in our lives. Afterwards we may feel like our doubts and fears have really broken our relationship with God and that at some point He will get fed-up with our up-&-down faith. But the good news is that in this Psalm we see God's character revealed to us. He is not a man. He doesn't function like us and I am so glad about that. He is loving and kind and so full of Grace...something that I focus on because of the meaning of my name. 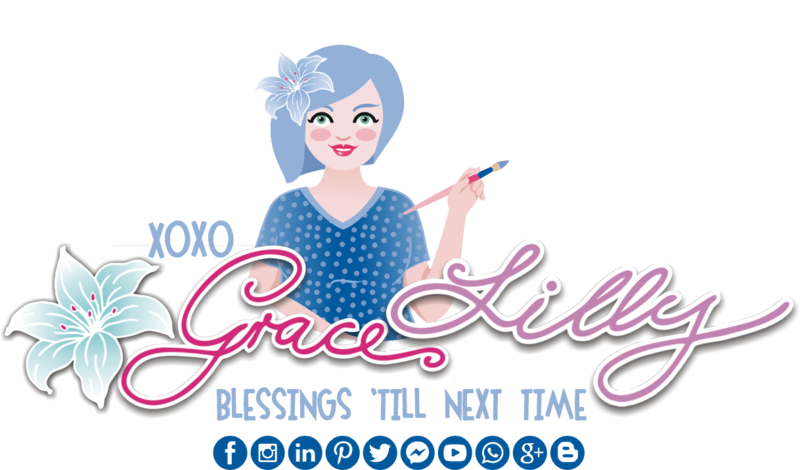 I want to live gracefilled and gracefully and pore grace into the lives of those He sends my way. Today He reminds me that it is so important to know my place in His heart and to know that it is never about my abilities, my power, how much I do or give or am perfect and perfectly follow through on everything. I probably wont. I am small and I realize how small in comparison to such a big and awesome God. There are no words to describe how I feel about this deep in my spirit. I can just say that it is really comforting to know that I don't have to be perfect for God's love to cover me and because of the sacrifice of His Son on the Cross, I can live in freedom without fear of judgement. I can live in the shadow of His wings, knowing that it covers all my iniquities and faults and mistakes and sin and everything I might feel like I am failing Him. You see, the enemy wants us to stand in shame and doubt and fear and that will destroy our faith. He wants to isolate us too. Isolate us from community. As an introvert, that is not hard to accomplish. We tend to live disconnected to others in general. Social anxiety and the fear of failing others, or not fitting in or just not wanting to engage because of the emotional load of others, makes us shy and not engage when we actually need to. When the enemy sees a gap here, he will take it and isolate us even more with his lies. If you read here today, don't you believe his lies! Jesus wants a full life for us all and living "connected" with others in harmony and piece, is important and I believe something He wants for all of us as His children. Remember that God's compassion covers us always. Live under that compassion. Breathe it in and breathe it out. Let it give you wings to fly all the way to where He wants for you to go. 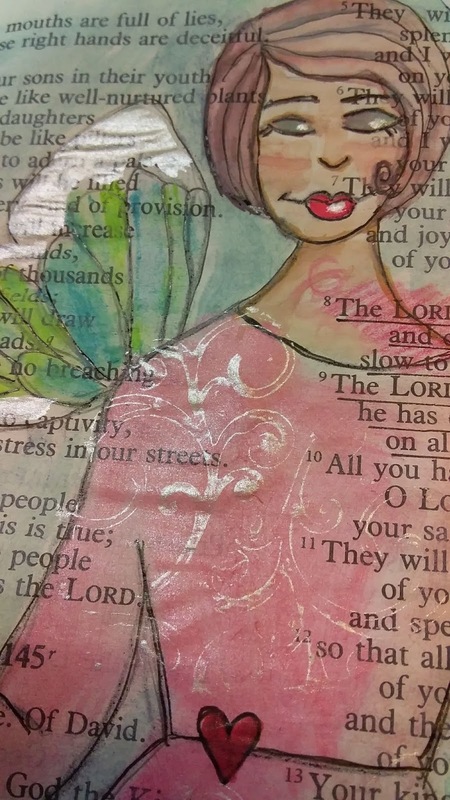 For those of you just discovering this blog and you haven't yet found us on Youtube, here is a little video we shared on the Ivytree Studio chanel there about this Scripture. 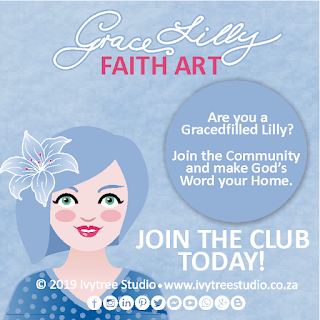 We will be building the Gracelilly Faith Art channel also and all our Faith related videos will from now on be shared on the Gracelilly Channel here. #Faithgirl collection and all them will form part of the full collection. 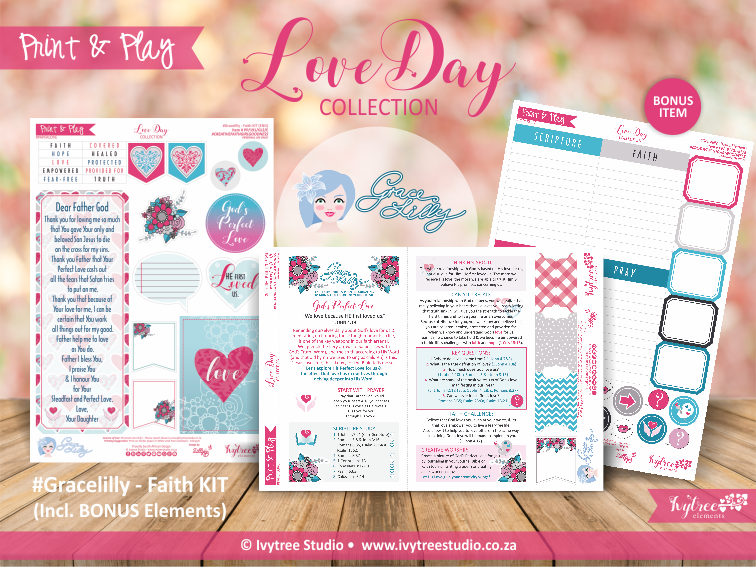 As always this collection will have a devotional kit and it will be available in both English and Afrikaans as well. I will do Print&Play kits and physical kits for this collection. I am taking my time with it, because I want it to be really special. In the meantime, you can download this little girlie over in the store here. Hi there. My name is Ansu and I am daughter to the King and a Christian Artist, Educator, Entrepreneur, Blogger, Designer and wife to my husband, Henry. 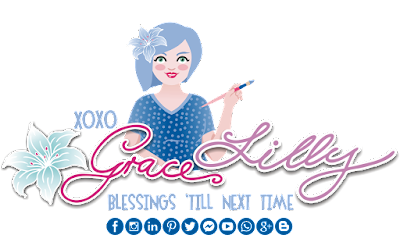 My name means “Gracefull Lilly” and I hope to encourage women of all ages with a ministry of Grace, creativity and care here. 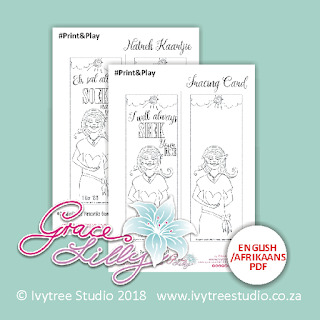 (c) Ivytree Studio 2019 - www.ivytreestudio.co.za. Ethereal theme. Theme images by Ollustrator. Powered by Blogger.